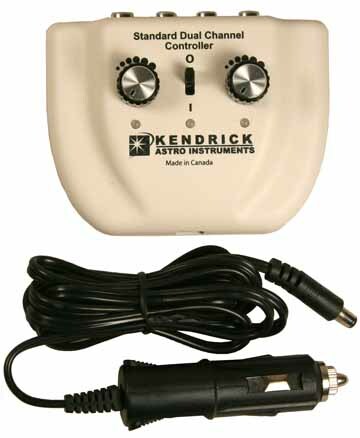 This controller has been introduced to replace our original, long standing Model VI controller. The Standard Dual Channel has a ton of new features but is really simple to use! 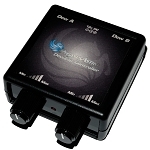 As well, it can handle more power and use that power more efficiently! We are very excited about this newest addition to our Dew Remover System! Rugged Plastic Case with modern styling. Zero to 100% heater control. On board protection from over current, over temperature, over voltage. LED overcurrent indication at both outputs. 6' detachable fused Power cord. Cord is fused at 7 amps. On/off switch (no other dew controller on the market has this). RFI (radio frequency interference) free. A critical feature for astro imagers! Pulse Width Modulation duty cycle control. 4 outputs, 2 for each control knob. LED Power on indicator for both outputs. Mosfet transistors built on board and on EACH output (no voltage drops!). Get the best possible performance out of your heaters! Dimensions: 4" x 3" x 1.35" (1.75" with knobs).